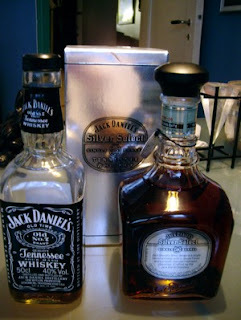 I love Jack Daniels, delicately sweet and smoky, on the rocks or the Scottish way, with lukewarm water. Jack Daniels, and the two other brands of Tennessee Whisky, Gentleman Jack and the wonderful rich and sophisticated Jack Daniels Single Barrel are classical American specialities from a tradition going far back in time. In fact, the Jack Daniels saga goes back to the mid 1870s, when Jasper Newton "Jack" Daniel, founded Jack Daniel's Tennessee whisky distillery in Lynchburg, Tennessee. He was of welsh descent, and as he was childless, his nephew Lem Motlow took over, and owned the distillery until he died in 1947. Since 1957 the brand name and production were taken over by the Brown Forman group. The Jack Daniel website has what it calls a "tasty part" of the official site called Around the Tennessee Table. Here you get recipes for drinks as the Tolleytown Celebration Punch or Jack Daniel's Cactus kicker. Jack Daniels is also great as an ingredient in savoury dishes as part of a marinade, or in sauces and you can even use it in desserts. I love Buffalo Wings and what about Tabasco® Jack Wings, or Hot sweet and sour Tennessee whisky meatballs? It sounds seriously good. And you can share your recipes. The restaurant chain TGI Friday's has successfully used the whisky in different dishes as the Jack Daniels Sampler with Jack Ribs, and sesame Jack Chicken with its own Jack Daniels sauce. The smokyness blends in with its sweet and salty ingredients in their dishes. My cousin, Ann Eastman McDonnell makes her own Tennesse whisky marinade. Jack Daniels, Dijon mustard, demerara sugar and soy sauce blend into a great mix of sweet smokyness from the sugar and whiskey, the heat from the Dijon mustard, and the salt soya sauce. I do not think she use any measurements, as she cooks the way I do, mix ingredients with caution and taste until you like the combination. She allows the steak or steak tips to marinate for at least two hours (I personally recommend over night), and then pan fry the beef. And do not throw the marinade away!! Use it as a base for a sauce. I personally have used Jack Daniels in sauce for beef or game, and it really gives an interesting twist to the sauce, and people always ask what the secret ingredient is.